Today we take the final push to the Super Bowl. It is Ben’s 7th season. It is our 77th year as a franchise. It is in the cards, climbing the Stairway to Seven! We are headed to church, decked in gear, pumping Black and Yellow. How many others from Steeler Nation will be wearing the colors? Sadly, my dad (the pastor) won’t be donning the jersey ’til sb, but will have a tie. That’s ok, our littles have plenty for us all. 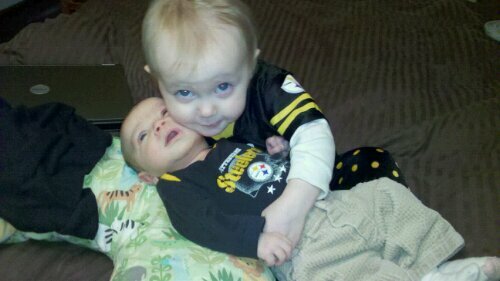 <3 GO STEELERS!!! This entry was posted in Pittsburgh Fun, Weekends. Bookmark the permalink.